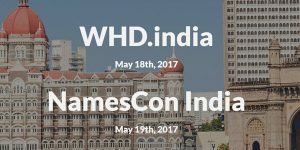 On May 18 and 19, 2017, WHD.india and NamesCon India were back-to-back for the first time. These complementary events brought together hundreds of people in cloud services, web hosting and domains in India. WHD.india 2017 was the seventh event focused on the rapidly expanding cloud and internet market in India. Last year WHD.india took place in Bangalore with more than 1000 attendees, but this year it returns to the City of Seven Islands, Mumbai. WHD.india was jam-packed day with keynote presentations and informative sessions where industry experts discussed the hottest topics and the latest advancements in software and services for the cloud. New for 2017, the sister conference NamesCon came to India for the first time. Since NamesCon India is the day after WHD.india and takes place in the same location, it’s like getting two premium technology conferences at once.